Airing My Laundry, One Post At A Time...: Afraid of Heights. Went Parasailing Anyway. Afraid of Heights. Went Parasailing Anyway. Maybe I shouldn’t have inhaled all that pasta for lunch. I chewed on one of my nails. I could do this. Teenagers were currently parasailing. If they could do it, so could I. One of the owners of the boat came over and began attaching the harness to me. This was it. No backing out now. 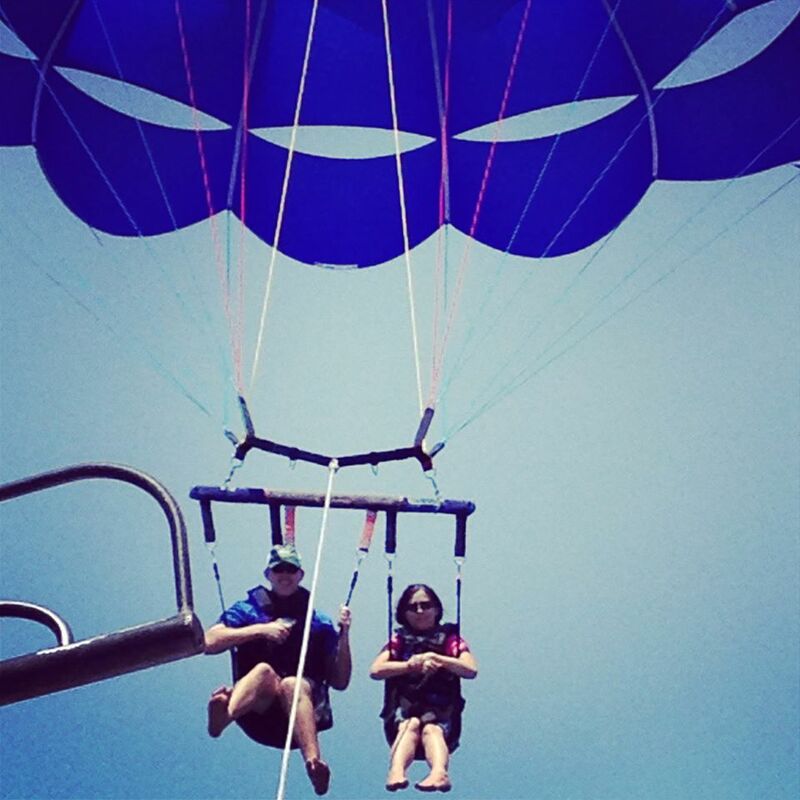 I was at the beach and decided to go parasailing with my cousin. It was a spur of the moment thing. Maybe I should have thought things through. But no, if I did that then I might have decided NOT to parasail. And I needed some adventure in my life. The teenagers were coming down. At least this parasailing experience wouldn’t include being dunked in the water. I could not be dunked in the water. I panic when I go under water. “It’s almost your turn!” the boat worker said, giving me a thumbs up. “I need to pee,” I answered. Well, no, I kept that to myself. I probably didn’t need to pee. I just get that sensation when I’m nervous. The teenagers were on the boat now gushing about their experience. “It was fun!” they both said, giggling. Well, teenagers think listening to Justin Bieber or One Direction is fun so their idea of fun could be completely different than mine. I took a deep breath as the boat worker led us to the area where he’d be hooking us up to. 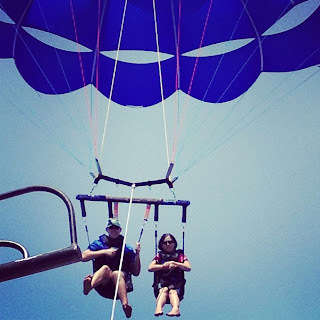 I was tandem parasailing with my cousin so at least I wouldn’t be alone. I gripped the bar and waited. “Here we go,” the worker said and suddenly we were being lifted into the air. “You can let go!” the worker said to me. I was gripping the sides tightly. I cautiously let go and…oh, I was okay. I just hung there. “This isn’t bad,” I told my cousin. And it really wasn’t. Yes, I’m afraid of heights but we weren’t up terribly high. Plus the boat wasn’t going too quickly so my stomach didn’t flop around. It was pleasant. When it was time to be reeled in, it wasn’t frightening either. They had one of those crank systems so we were brought down slowly. 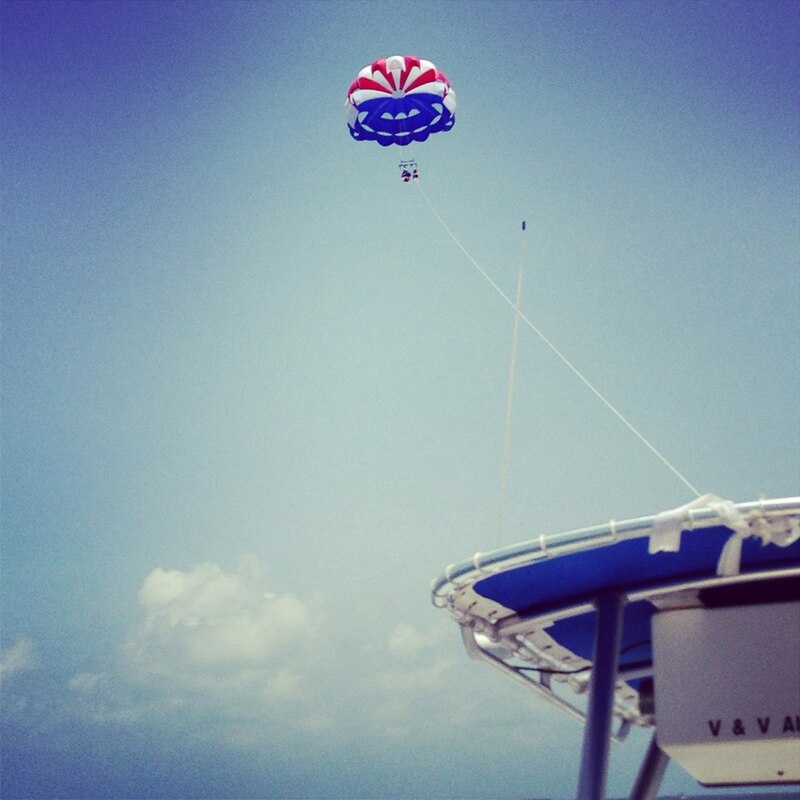 I would go parasailing again. I recommend it. Even if you are afraid of heights. I think I'd like it! I accompanied an ex once when he did it and he was so green by the boat ride itself, but he was fine up in the air. Strange dude. I chickened out, though. I wish I hadn't. Just so we are clear - you don't land in the water? Because that's the only thing been holding me back from trying it. I can't swim and I don't want to drown. If that's the case, then maybe next time we get to the beach, I'll be brave enough to try it. I'm so terrified of heights I can't stand on a chair without having a panic attack. This would probably kill me. More power to you though for doing it! This is on my bucket list!!!! Oh wow! That's looks and sounds like fun!! Good for you for stretching outside of your comfort zone! Thanks for the encouragement! My fiance and I are thinking about parasailing while we're in Florida next week for my 30th birthday, and I could really use some fun and stress relief. What better time than my birthday / vacation to Florida? I'm afraid of heights and not a wonderful swimmer but with him by my side I think I might just have to try it =D Wish me luck!